Dartford FC got a bit of a drubbing at Luton Town, losing 3:0. 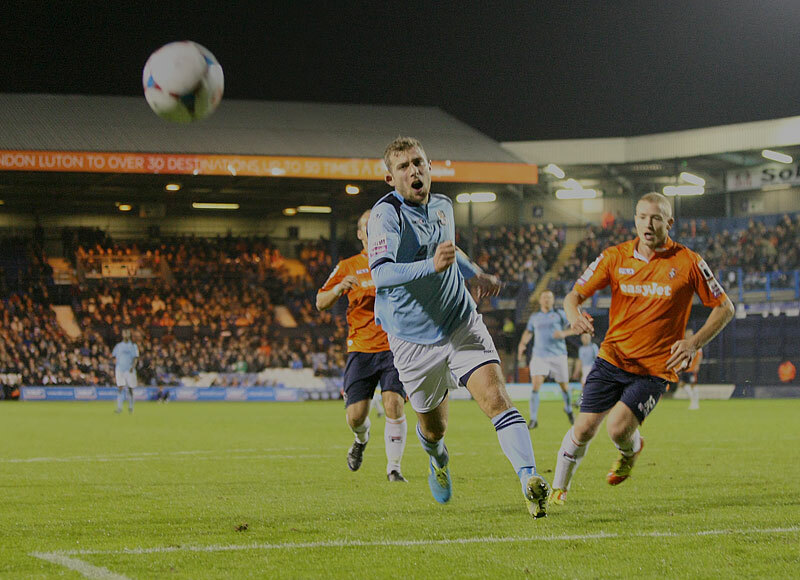 There were a couple of opportunities to score, but the majority of the game went to Luton’s Hatters. I know, I was down the wrong end, so most of the action was out of reach for me. 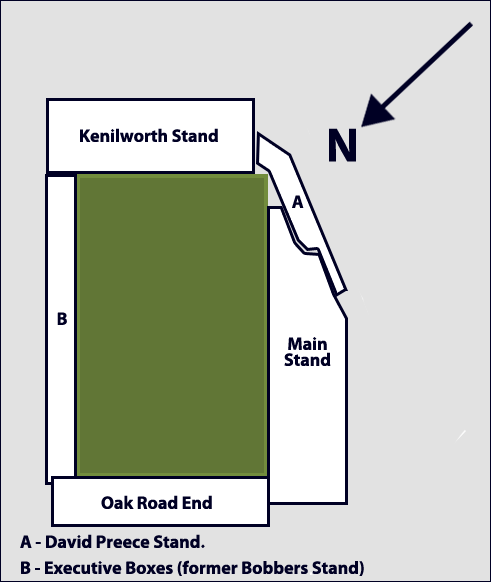 Luton’s Kenilworth Ground has been there since 1905. It accommodates up to 10,000, and 5,000+ attended the match. 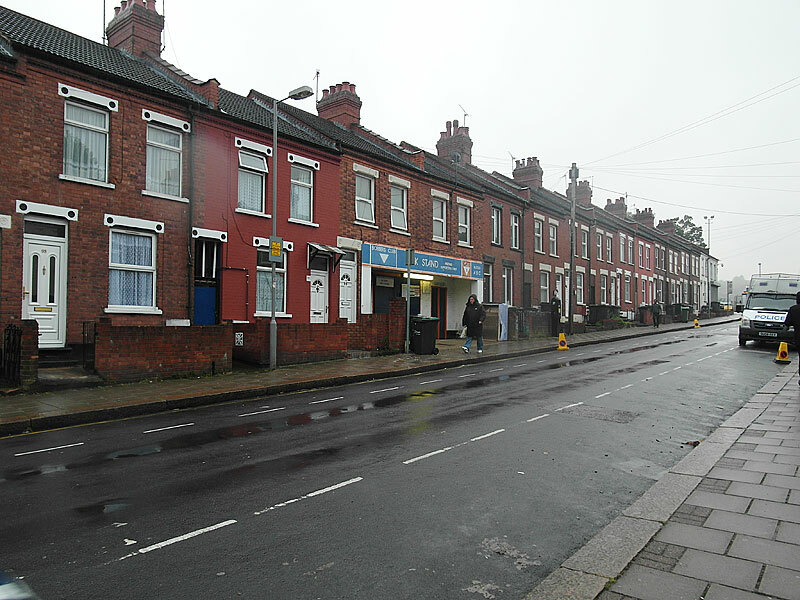 It is hemmed in with little Victorian terraced houses on one side and a new dual carriageway on another. 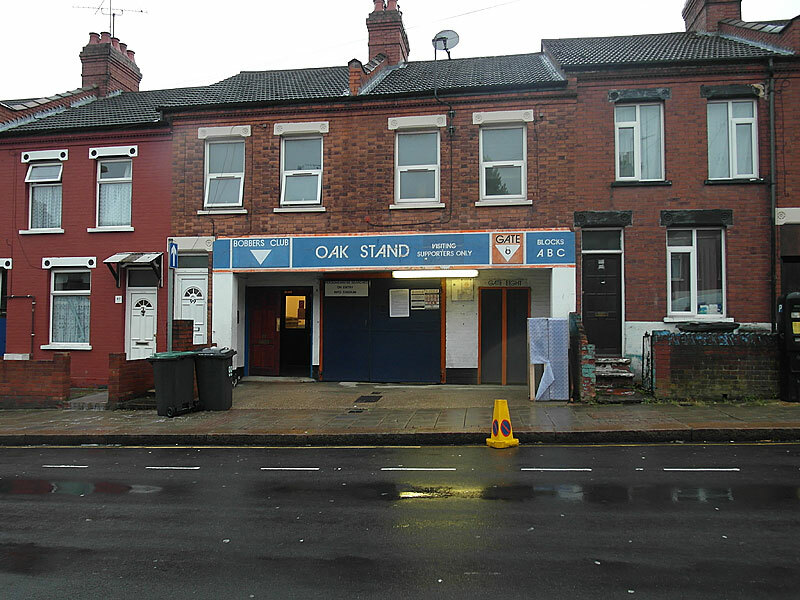 The away supporters gain access to the Oak Road end of the ground via an unusual and well camouflaged entrance. One part of the stadium is called the Bobbers Stand as entrance once cost a Bob! – a shilling for those of you old enough to remember pre-decimalization – and is so low that you can clearly see the houses behind it. In 1986 the Bobbers Stand had its seats ripped out to be replaced with executive boxes that look like unattractive portacabins. Netting has been suspended between the floodlight pylons on its roof to reduce the number of footballs being kicked out of the ground and into the back gardens of the adjacent terraced houses. 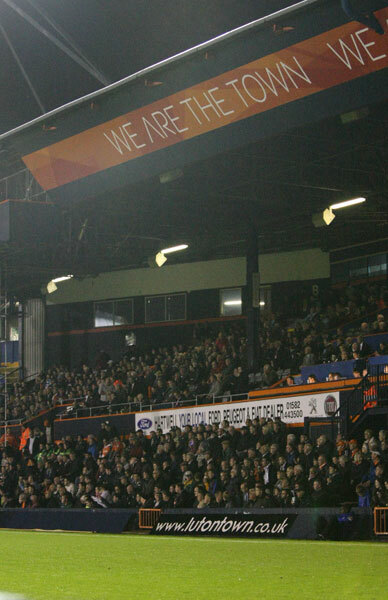 At Luton Town’s ground there are only a few places you can shoot photos from. Can’t sit along the sidelines because on the large Main Stand side you would obscure the view of the spectators, since they sit fairly low. On the other, the club feels its more important to be able to see the advertising boards and doesn’t want the odd body in the way – but the ball boys are OK! So can only shoot from behind the goal line. There is not a lot of space around the pitch, so I chose to sit behind the boards where there were no immediate spectators. In the second half, Dartford were shooting towards the end where the away supporters are housed, and because the spectator area is well below the pitch level, I could stand behind the line and shoot over the boards fairly comfortably. In writing this entry, I came across a report into the price of non-league football by the BBC. The report found the Conference Premier’s most expensive offering in the cheapest day out category is at Grimsby, at £25.50. Alfreton Town price their cheapest match-day ticket at £18. Dartford charge £15.00 as a standard rate. Aldershot Town’s cheapest season ticket is the most expensive in the division at £322, with Grimsby’s costliest offering the league’s highest at £575. The cheapest season tickets at Aldershot, Halifax and Luton cost more than the equivalent at Premier League Manchester City, whose £299 season ticket is the cheapest in the top flight. (The most expensive is £1,955 at Arsenal, although this includes seven cup matches.) Dartford’s renewal was £250 for the current season and new holders pay £280. 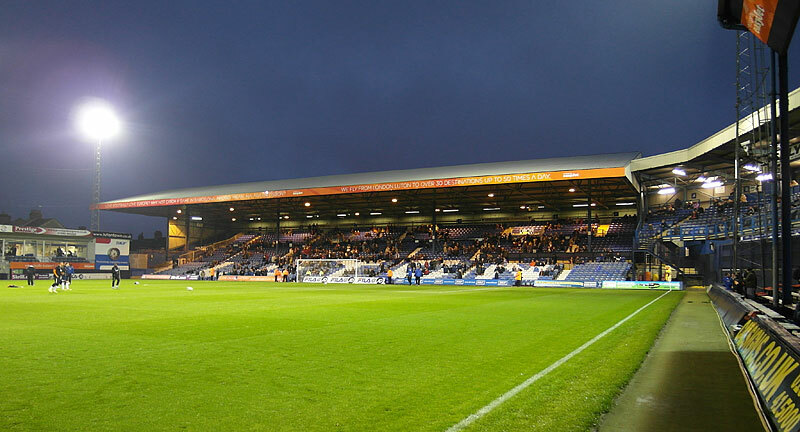 Southport’s £10 match-day ticket is the cheapest in the league, while Wrexham charge the most for a cup of tea at £1.80, with a host of clubs selling at £1. Kidderminster’s £4 home-made pie is only matched in price in the top five divisions of English football by Premier League Crystal Palace. No idea what these pricey pies taste like, but I’d be surprised if they are anywhere as good as those The Hairy Bikers tasted when they visited the Globe Arena on the day of Morecambe’s 6-0 win over Crawley and met head chef Graham Aimson who oversees what seem to be the tastiest pies ever.